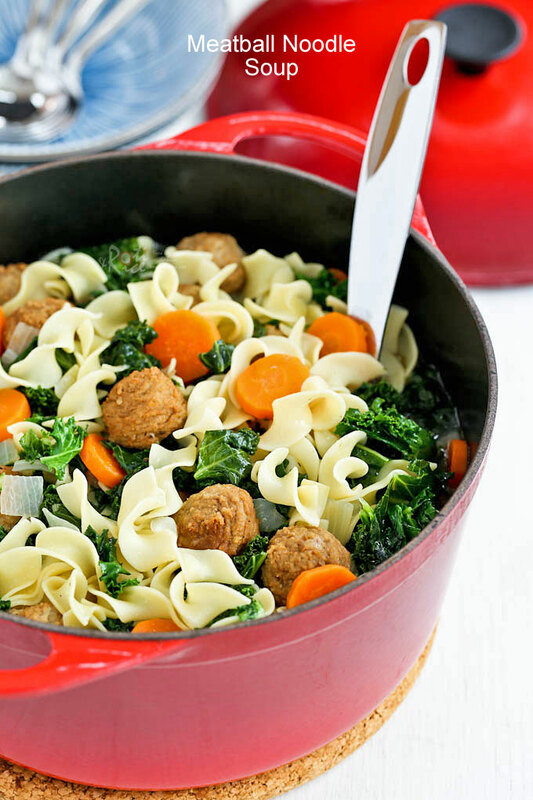 This warm and delicious Meatball Noodle Soup is comfort in a bowl. Very easy to prepare and perfect for cold winter evenings. 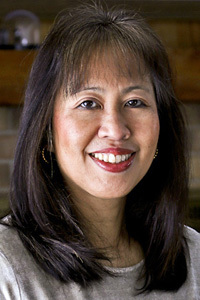 Winter may officially start in December and end in March but in Minnesota, the weather starts to turn cold in November and continues right through April. Some have called this place Icebox USA and there are days when it is an apt description. 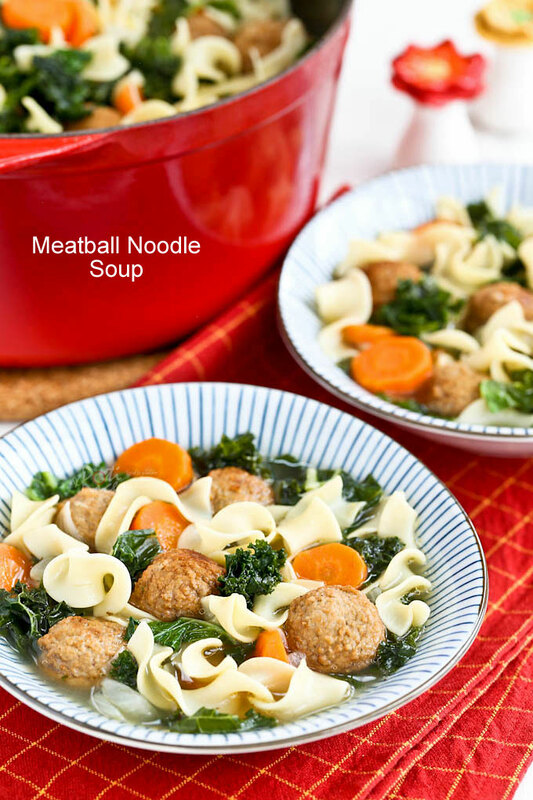 That is why we are big on comfort food and there are few things more comforting and warm than this Meatball Noodle Soup. 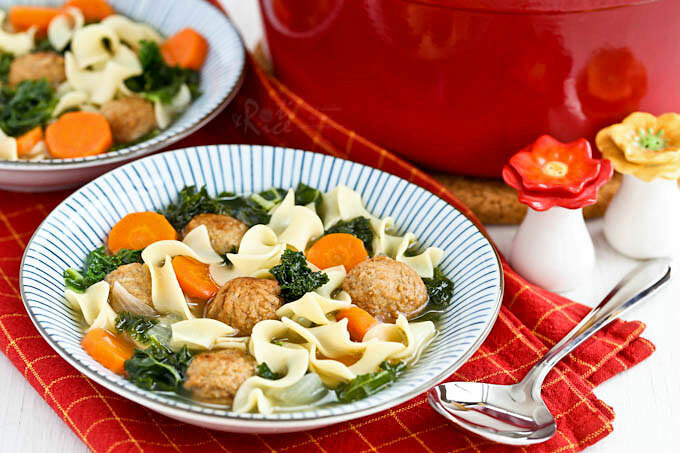 Tender meatballs, hearty kale, smooth, firm, and delicious No Yolks® noodles make this one-pot Meatball Noodle Soup something to look forward to especially after shoveling snow on the driveway. No Yolks® noodles are cholesterol free and always cook up right. It is a brand I trust for all my noodle recipes. The noodles come in a variety of noodle cuts – Broad, Extra Broad, Fine, Kluski and Dumplings. They’re even available in Whole Grain. I can’t wait to give the different varieties a try and I hope you will to. For this recipe, I used No Yolks® Extra Broad Noodles to soak up the delicious clear broth. I cooked it for half the time before adding it to the soup to finish the cooking. It came out perfect! They were smooth, firm, delicious, comforting, and warm. The soup was really yummy and the family loved it! Heat meatballs in a 350˚F (180˚C) oven for about 20 minutes or according to packaging instructions. Bring a medium size pot of water to a rapid boil. Add noodles and a little salt. Cook uncovered for 6 minutes. Remove with metal strainer and set aside. In a dutch oven or heavy-bottomed pot, heat vegetable oil. Saute onion and carrots for 2 minutes. Stir in dried thyme. Pour chicken broth into the pot. Bring it to a boil. Add preheated meatballs, cooked noodles, and kale. When soup comes back up to a boil, season with salt and pepper. Reduce heat and allow soup to simmer for 3 to 5 minutes. Serve on its own or with crusty bread, if desired. 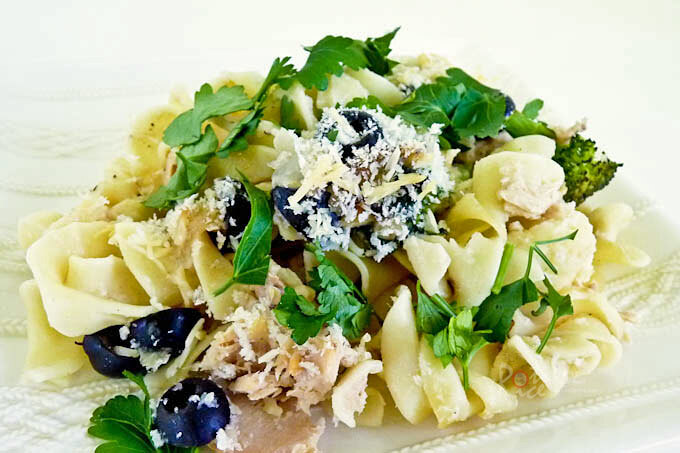 Do check out my Tuna Noodle Casserole for another recipe using No Yolks® Extra Broad Noodles. For even more noodle recipe ideas, follow No Yolks® on Facebook, Pinterest, or try one of these family-favorite, comforting noodle recipes and get $1 off 2 bags coupon on their website. 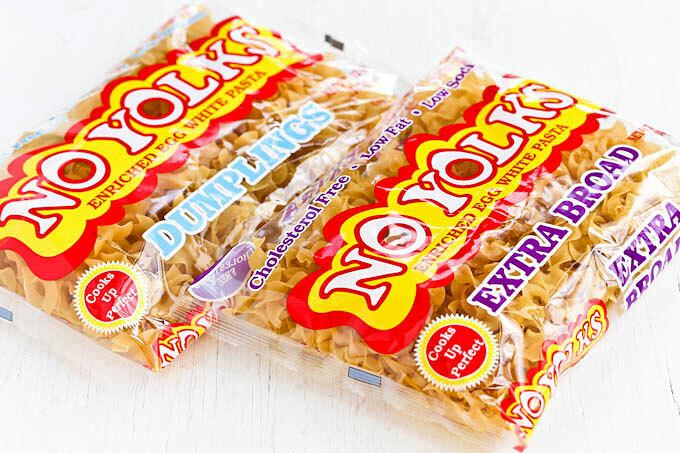 No Yolks® noodles are available at grocery stores nationwide at an average cost of $2.09 per bag. I can’t wait to see and hear what delicious, warm, and comforting dishes you will make using No Yolks® noodles. Share your ideas in the comment below for a chance to win a $100 Visa Gift card. I like to use these noodles to make my Creamy Chicken Noodle Casserole that I make this time of year! I like your Meatball Noodle Soup! I would make a tuna noodle casserole. I would make a chicken and noodle casserole with mashed potatoes. My mom used to make a cheesy chicken casserole with No Yolk noodles, chicken, cheese, cream of mushroom soup and butter and breadcrumbs and peas!! My favorite comfort food growing up was mac and cheese and it still is today. My favorite comfort noodle dish is definitely Beef Stroganoff so I would make that. I would make a tuna casserole with noodles. I love baked macaroni and cheese. I think it will always be my favorite comfort food! I would like to make beef stroganoff. We often make a noodle dish with canned chicken, mushrooms, peas, and sour cream. My favorite comfort food is a warm soup of any kind, or a spicy beef stew. Your recipe looks delicious! I would like to make a tuna and noodle casserole with no-yolk noodles. Cream of mushroom over noodles. One of my favorites is macaroni and milk. Basically I use cooked egg noodles and add some milk, salt and pepper and heat it up. My Mom would make this for us as kids and now my family loves it. I would make cheesy tuna noodle casserole. Right away I’m thinking tuna noodle casserole with Ritz cracker crumbs on top. This time of year, I would want to make beef Stroganoff. That looks delicious. I love soup! My favorite comfort food is definitely my homemade fettuccine alfredo! I’ll definitely be making some tuna casserole with these noodles! Makes me hungry just thinking about it! This noodle sounds wonderful. I would use it to make pan fried noodles with mushrooms and shrimp. I would make chicken fettuccine or beef stroganoff. Will try to make the tuna casserole for my boys! 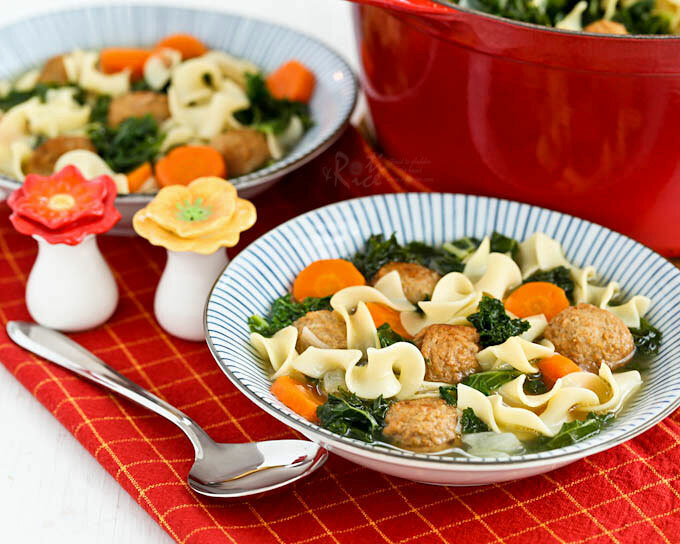 I love the look of your soup, kind of a pleasant twist on Italian Wedding Soup. An idea with the No Yolks would be to use a basil pesto sauce with grilled chicken, sundried tomatoes, feta cheese, garlic and pine nuts. Well, gotta run…My kitchen is calling me! I love to make tuna noodle casserole! Hearty chicken noodle soup would be delicious. I would make chicken noodle soup. My favorite comfort dish is beef stew served over noodles. I will make chicken noodle soup. No Yolks are a must for my chicken noodle soup, but I also love them simply as a side dish with butter. So good! I’d make noodles with a creamy mushroom sauce. I’d make chicken noodle soup. i would make chicken noodle soup! I love lasagna with lots of cheesy garlic bread! That’s perfect comfort food to me! The comfort dish I would make with noodles is tuna noodle casserole. Stew beef and noodles sounds good!! Greek Stew over noodles brings back many happy memories. My fav dish to make using egg noodles is “beef” stroganoff. I am a vegetarian, so I use Gardein “beef” tips rather than real meat. It is SOOOOO good! I would make beef stroganoff as well as chicken noodle soup, two of my favorites. A warm and comforting dish that I make using No Yolks noodles is my Creamy Chicken Noodle Casserole. I like to use No Yolks noodles in my mom’s beef & noodles recipe. I’d make a chicken alfredo casserole with it. Your recipe looks great! i would make spaghetti & meatballs but with a pasta twist. With these noodles I’d make beef and veggie soup.